BILLUND, Denmark and Burbank, CA – December 16, 2011 – Warner Bros. Consumer Products and The LEGO Group announced today a partnership that awards the world’s leading construction toy brand exclusive rights to develop build-and-play construction sets based on THE LORD OF THE RINGS™ trilogy and the two films based on THE HOBBIT™. The multi-year licensing agreement grants access to the library of characters, settings, and stories for THE LORD OF THE RINGS property, as well as films The Hobbit: An Unexpected Journey and The Hobbit: There and Back Again. LEGO® THE LORD OF THE RINGS construction sets are slated for a rolling global launch beginning in June 2012 in the United States, with LEGO THE HOBBIT: AN UNEXPECTED JOURNEY scheduled for later in the year. The LEGO THE LORD OF THE RINGS collection will translate into LEGO form the epic locations, scenes and characters of Middle-earth as depicted in all three films, including The Lord of the Rings: The Fellowship of the Ring, The Lord of the Rings: The Two Towers and The Lord of the Rings: The Return of the King. In late 2012, LEGO THE HOBBIT: AN UNEXPECTED JOURNEY will give fans of all ages a chance to build and play out the fantastical story and new characters of the legendary Middle-earth adventures depicted in The Hobbit: An Unexpected Journey from Academy Award®-winning filmmaker Peter Jackson, slated to premiere December 14, 2012. With mention of the popularity of current licensed themes and the future synergistic releases of the Marvel half of the LEGO Suoerheroes line and now LEGO Lord of the Rings due in June, I think LEGO is making a strategic strike to rule the toy aisle in 2012. While I doubt next year will mark the end of the world, It will certainly bring about the destruction of my wallet. Last edited by Draykov on Wed Oct 17, 2012 6:15 am, edited 2 times in total. Yes yes yes yes yes yes yes yes yes yes yes yes yes yes yes yes! ...will there be a LotR theme for the forums? It's going to be a very awkward Christmas dinner if I can't pick my jaw up off of the ground by then. Morgan19 wrote: Yes yes yes yes yes yes yes yes yes yes yes yes yes yes yes yes! I was kinda still waiting (And hoping) for a PoTC theme on the forums. The Licensed Themes section in the forum is going to explode in 2012, no doubt.
" One ring to rule them all, one brick to bind them..."
This is huge news. While I have little interest in this particular license, there's no doubt that it will be immensely popular and another monster theme for LEGO. A very good move. But will there be a LEGO The Lord of the Rings Videogame? It seems likely, but I saw no mention of such in the announcement. Why do you guys think Ace boosted our staff numbers so much recently? Couldn't have gotten better news! Yeah! Lego now has control of my two favorite licenses of all time. 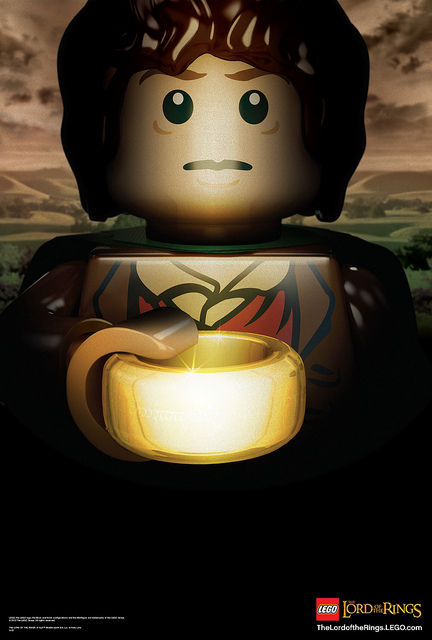 Can't wait to get Hugo Weaving's face in Lego form! I'm not sure if I want to get excited for this. On one hand yay LotR! But on the other, many of Lego's recent licensed sets have been of middling quality with very few gems. Make this theme shine Lego! I'm in the same camp as cas. At the very least, we're sure to get a score of cool new figs. cas wrote: I'm not sure if I want to get excited for this. On one hand yay LotR! But on the other, many of Lego's recent licensed sets have been of middling quality with very few gems. Make this theme shine Lego! QFT. The PotC line was pretty appalling in terms of the smaller sets. The same could be said of Star Wars for the past three or four years. Hopefully they'll take inspiration from the current Kingdoms line and previous Castle (Fantasy Era?) line to offer some decent sets at the lower price points, and not just excuses to sell minifigures. That said, I'm looking forward to the larger offerings. Helm's Deep anyone? Great news! I showed this to my wife and she looked at me like "Oh crap, do you need those too? I said no, but since I haven't seen the sets, we'll have to wait and see. I'll bet the Nazgul will look a lot like the Dementors from Harry Potter, except the Nazgul might actually have feet. I know this probably won't happen, but if LEGO released a set with all four Hobbits, I'd probably ok with just that. Might as well throw Legolas and Gimli in there, too. You know, I think I'm going to be in trouble. Man, I had to actually forum register to get in on this, after lurking for ages. Lego Minas Tirith! Lego Rivendell! Lonely Mountain! Giant barrel parts big enough to fit a dwarf fig in! Riders of the Mark to add to my arsenal of Lego horses! My desire to purchase Diagon Alley just evaporated. Instead I will be saving up for every single set in this line, for serious. I hope they do Smaug's lair with a little transparent Bilbo and I will heap in all my extra jewels and coins for the hoard. Last edited by alorian on Fri Dec 16, 2011 8:41 am, edited 1 time in total. Oh man, I don't think I can tell my wife (or kids). This is great news - I really hope them do it justice. There's no doubt they will be more costly than the Kingdom's sets (because of licensing), but hopefully not totally off the charts. Oh the opportunities for cool sets!!! though seeing as to how the themes will be going away, i have no idea how that's ever going to see the light of day. On the one hand, I agree with a few people before me that this could end up (at least for the The Hobbit sets) like the PotC or Cars sets where it seems like they only got some concept art to make sets based on... on the other hand who gives a frak, LotR sets! Plus they should do trilogy sets fairly well.